I've got matcha. I've got lots of matcha. In the form of fluffy, pillow-y pancakes to be exact. Joy the Baker knows pancakes. I mean she's created a few dozen types and recipes that are literally to-die-for. I fell completely in love with her Chai Spiced Pancake recipe. Literally, they are perfection. Fluffy and light, and ever-so-slightly spiced. So, with that, I decided to use her yummy recipe as a base for a creation of my own doing. 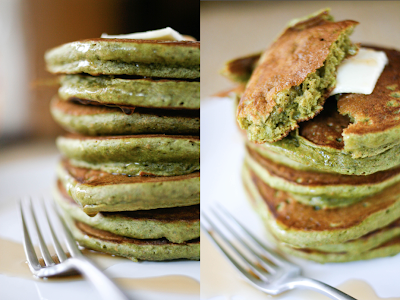 Matcha pancakes. Minus a couple ingredients here, add a couple ingredients there, tweak some things here and there and voila! 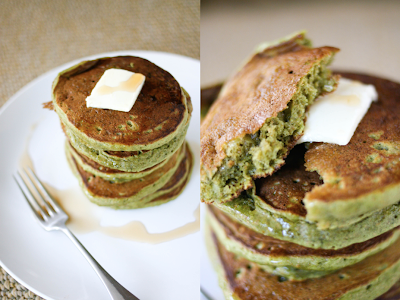 Matcha pancakes. 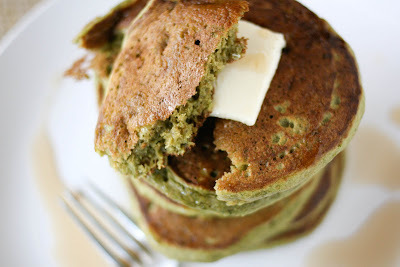 I added quite a bit of Matcha powder which just gave the pancakes a hint of that earthy, green tea flavor. It's really hard to get a prominent Matcha flavor but the suggestive flavor is really beautiful. Adapted from Joy the Baker, which can be found here. In a large bowl, beat the eggs. In a small bowl, mix the matcha powder with the water until well combined. Add the buttermilk, matcha mixture, butter and vanilla to the eggs and mix well. Add the flour, baking powder, baking soda and salt. Mix until smooth, let sit for a few minutes. Heat pan over medium heat. Add tsp. of oil or spray with cooking spray. Once pan is hot, pour two tbsn. of batter onto the pan and cook until bubbles start to form on the top, about 1 - 2 minutes. Flip over and cook another 1 - 2 minutes or until golden brown. I am completely in love with your blog. From the fashion to the recipes to the music recommendations, everything is wonderful!! I am in love with the recipe and the gorgeous photos! I haven't tried using tea in my cooking but I would love to try this. I love, love matcha. I never thought to make matcha pancakes before! I'm so excited to try this out!! those look absolutely gorgeous! I'll be visiting this blog just a little more frequent now. Cheers. Wow these look amazing! I love matcha and I love interesting breakfasts (it's my favourite meal). 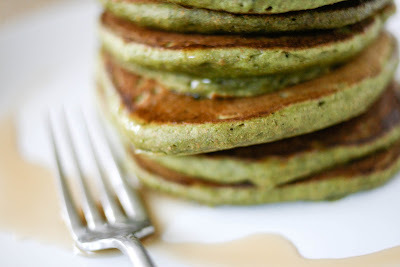 I will definitely be making these with our lovely Matsukaze Matcha (http://www.lahlootea.co.uk/product.php/51/7/matsukaze_matcha) for a lazy breakfast over Sunday papers after a busy busy week. Thanks, I'll be keeping an eye on your blog from now on. yummo! my gf would kill for that! Trust you to take a spectacular recipe and make it even better. I've been drooling ever since I saw these on Flickr. What a beaut! I was pointed here from another blog - I ALSO posted about matcha pancakes, what a coincidence! Love this blog, I will be back! This is my first visit here and found some really interesting stuff in your blog especially the recipes. I will definitely recommend for all my family. Keep up the good work.